3 Steps For Effective Water Damage Cleanup | MA Restoration Inc.
Two things are for sure: no one sits around hoping that their property will be hit by water damage, and when water damage hits, it’s never exciting. In the midst of a water damage catastrophe, it’s easy to become overwhelmed, and it can sometimes be challenging to know what you should do. M.A. Restoration located near Framingham has compiled a list of three steps you should take when you suspect your property is experiencing water damage. The first thing you should do is try to locate the source of the problem. By locating the source, you will be better able to understand how or why the damage is occurring, and consequently, be more equipped to address it. In some situations, finding the source of the problem may be simple. If your bathroom is covered in water and your tub has been running for hours, then logically, the source of the damage is your tub being left on. If your window well is filled with water because you have a broken sprinkler spraying water that way, then the source of the damage is the sprinkler. Other times, locating the source might be more difficult. For example, if one of the walls in your basement is damp all the time and begins growing mold, and you don’t know how water could have access to the area, it may be very difficult to locate the source of the problem. If you are unable to readily locate the source of the damage, skip to step number three. Step two: stop the water from spreading more if possible. 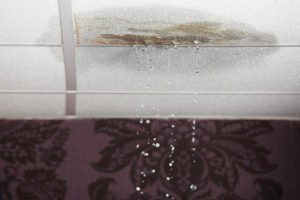 Once you have found the source of the water damage, it is important to stop the damage if possible. If your tub is overflowing, turn it off. If your sprinkler is flooding your window well, turn off your sprinklers. If you suspect that the damage is coming from any of the water lines in your house but you either do not know exactly where it is coming from or do not know how to stop the water more directly, you may want to consider turning off the water to your property entirely. Through stopping the damage from spreading any more than it already has, you make sure that less further damage takes place and, as a result, make any restoration processes your property is to undergo easier. Calling a professional water damage cleanup company is the last step for effective water damage cleanup, and perhaps the most essential of all the steps. Professionals have the experience to ensure that the damage is dealt with to the full extent that is necessary. They also have the up-to-date equipment and training that make handling water damage easy. Luckily, if you were struggling to find the source of the problem, they have the skills to identify it and make sure that a similar water damage problem doesn’t arise from it in the future. If you live in or near Framingham, call M.A. Restoration to help with any water damage cleanup needs you may have.